What really happens after we die ? Here, I’ve no idea to stir up the metaphysical-religious discussion in this blog. But making plans for what happens after you’re gone is really important for the people you leave behind. So that the search engine Giant has come up with a new feature. using that feature one can tell Google what you want done with your Google account when you die or can no longer use your account. The new feature is named “Google Inactive Manger”, Google itself claimed that this name is not great name for this service. 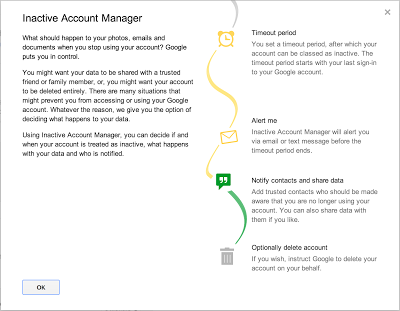 You can get this feature in Google account settings page. By using this service, you can tell the Google, that What should Big G will take action for your Inactive account or if you have kicked the bucket. “What should happen to your photos, emails and documents when you stop using your account? Google puts you in control. Inactive Manger gives some much-needed option to control your Digital assets to give it to someone like your friends, Relatives and beloved one. Using this now you can set timeout period for your account like 3 months, 6 months. Google will take action after time out expired. This actions can be set in your Google Inactive setup such as you have the option to set to get notification email or text before the period lapses, which gives you the opportunity to stop the process before it goes any further. If you haven’t stop action process, then Google will notify any predetermined contacts and, depending on the user settings, may share their Google data with them or delete it. Google Inactive Manger includes Following services: +1s; Blogger; Contacts and Circles; Drive; Gmail; Google+ Profiles, Pages and Streams; Picasa Web Albums; Google Voice and YouTube. This gives you the some little preparation, that who should use your digital assests and gives the opportunity to your beloved ones access your account.